It’s hard to connect one by one, remembering the people you met through your life. Rather than rack your brain, LinkedIn allows you to import your online address book. 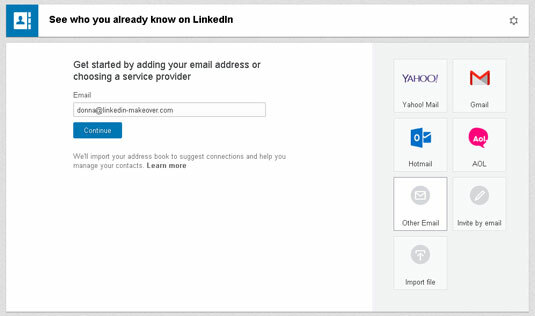 Scanning your email address book shows you who’s on LinkedIn already, and LinkedIn allows you to automatically connect with them. On LinkedIn’s main toolbar, hover your mouse pointer over My Network and select Add Contacts (some users might see Invite Contacts). The Add Contacts page appears, as shown. A list of email providers appears on the right side of the page. This is the page where you add connections via email or csv file. Enter your email credentials and accept any permission requests. LinkedIn scans your email address book looking for profile matches and presents you with a list of people you know who are already on LinkedIn, but not connected to you. LinkedIn displays the profile matches based on email addresses in your email address book. LinkedIn automatically selects all contacts. Do not click Add Connections! It’s important to first go through this list one by one and select or deselect who you want to invite to connect with you on LinkedIn. Remove the check marks by clicking in the circle to deselect the individuals you do not want to send a connection request. Click the Add Connections button. An invitation request is sent, and then LinkedIn displays a list of people from your email address book who are not on LinkedIn that you can invite to join, as shown here. LinkedIn displays the people who are not on LinkedIn that you can invite. Deselect the people on the list you do not want to invite to join LinkedIn and click the Add to Network button, or click Skip to skip this step. Invites are sent to those people you selected and you are back at the People You May Know Screen. It’s absolutely acceptable to skip sending invitations. LinkedIn has over 400 million users. Most times, those people who show up as not on LinkedIn, are on LinkedIn but with a different email address. Rather than bombard people with LinkedIn invitations, skip this step and concentrate on connecting with people who are definitely on LinkedIn already.